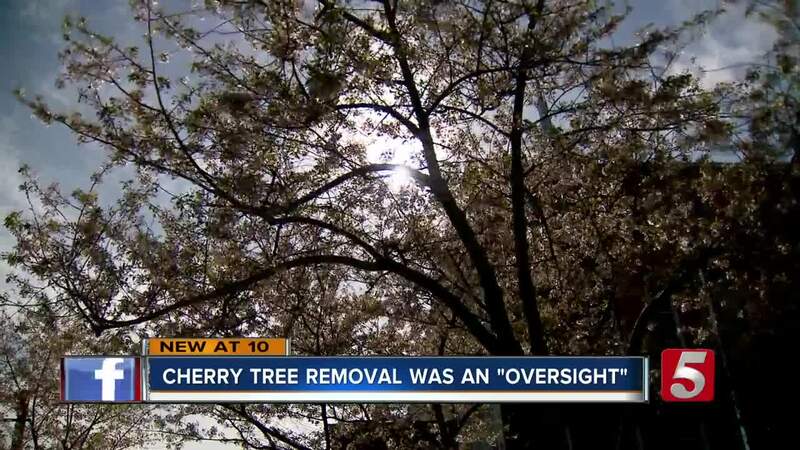 NASHVILLE, Tenn (WTVF) — A lack of communication and oversight, that's what some are saying led to the public not being involved in the decision to cut down some of Nashville's cherry trees. More than 20 trees were scheduled to be removed to make room for a stage for the NFL Draft, but after public outcry over the weekend, it was decided ten trees will be uprooted and moved. Since January the NFL and draft officials worked with the Mayor's office to discuss final approval on the event's plans. However, the plan to remove nearly two dozen cherry trees was never placed on the agenda of the Parks Board making it not open to the public. The decision to remove them was enough to leave several people upset . "We're all here because we had enough and we're looking to change something," said Jim Gregory with Nashville Tree Conservation Corp.
Tree enthusiasts showed up at city hall with signs in their hands wanting to know why the city decided to remove several cherry trees . "The precedent that this sets that just anyone can come in and scheduled an event and move our trees around like traffic cones is not acceptable," said Gregory, who went on to say this can never happen again. Butch Spyridon, CEO of the Nashville Convention and Visitors Corps, told the public and metro council members on Tuesday that he is sorry, "We apologize for not doing a good enough job communicating on all levels." Spyridon and officials with Parks and Recreation joined Tuesday's Metro Council Parks, Library And Arts Committee to discuss the issues and what they can do differently in the future with similar situations. "I realized that the event not coming to the Parks Board was an oversight," said Parks Director Monique Odom. However, there is reason why the public and metro council members were left in the dark about the future of these trees. "This is not a big project, this was a very small parks' project," said the Metro Parks horticulturist. Randall Lantz says in his experience this was not the removal of a lot of trees. Director Odom says with the location of cherry blossoms the public should have been involved. Gregory and others agree, "they're could have been better planning, better communication, the community was given two days’ notice that this was going to happen; that's laughably not enough time," Gregory said. The ten cherry blossoms will be moved tomorrow morning. If any of the trees die in the process the N-F-L will replace them. And, as an act of good faith, the Nashville Convention and Visitors Corps and the NFL will plant more than 200-new cherry throughout to the city.